Discussion in 'Transformers News and Rumors' started by Tony_Bacala, Apr 19, 2018. Sweet! I was just searching for the new one this year. Y'know...I'm kinda regretting not getting the first few now. Had I known then that this was going to be an every year thing, I probably would've picked them up. The earlier ones are fairly still original price, except Optimus. 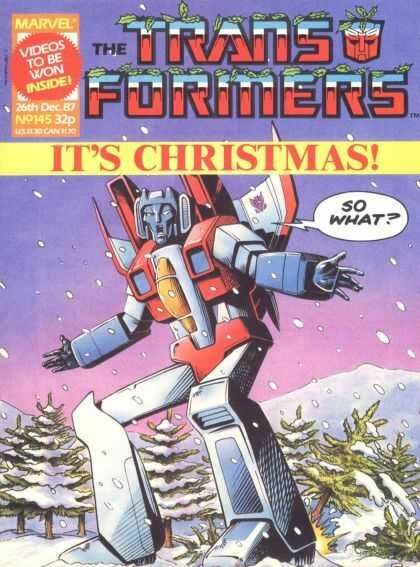 Didn't Starscream have a Christmas-themed comic issue? Oh. I must have misread that comment. Oh and I totally agree with you. I NEED Hallmark Starscream. Yea... I said they should make new heads for the actual toys (that do transform) instead of completely new ornaments. The new heads would have a loop to attach a hook to hang the toy on the tree. Why? The last four were very G1 toy based. If anything, they should have given him a dark grey or black canopy as the G1 toy didn't have orange there. What bugs me the most is that all the others were put into their G1 boxart poses ( even though the G1 toy they're based on couldn't get in those poses ), but Starscream is just standing there just like the toy. I just like how the characters look on screen more than how their toys look in real life. I would’ve preferred the last 4 to be more toon inspired than toy inspired too. That looks really good! Hits right in the G1 feels. I think I'll pick this up. Its even got the eye visor sticker already applied! No need for DIY tweezer application. Neat! I already got the other four so this is a must but even if I didn't have the others this would still be a must... Its Starscream! Kind of expected Bumblebee this year though since you know he had his own movie coming out but I'm hopeful next year its going to be Jazz. Nice! Will add to my collection. Figured it would be an autobot though. Amazingly none of them have broke on me so far. Very cool! Got Starscream for Christmas in 1984, so this'll be a memorable addition to my ornaments! I collect these every year and put them up on my Christmas tree (much to my wife's dismay). Optimus, Megatron, Soundwave, Grimlock, and now Starscream will be mine! Definitely going to have to get this. I already have Megatron and Soundwave, so this will look good with them! I'm happy it's Starscream. I thought they were going to keep alternating between Autobot and Decepticon and was afraid it would be Bumblebee. I don't understand why it can't Transform and I do by non-transforming transformers, so I'm not just complaining. The transformation would be so simple. Licensing issue. Hasbro will not grant a license for transforming merchandise. Because these aren't toys, they're tree ornaments. The parts are small and fragile, they'd break easily and in the case of Starscream you'd probably lose the little fists. Hallmark Keepsake Ornaments event started this morning. Starscream is now available!